Thereâ€™s a new movie out in the theaters right now called Children of Men. The movie is based on a novel by the English writer P.D. James. I almost went to see the movie Thursday night, but after reading a number of reviews, I decided to wait until Iâ€™ve read the novel, which is said to be far better than the movie. The fictional premiss of Children of Men, the book and the movie, is that three years from the present date, a mysterious epidemic of infertility has set in over the whole world. The story takes place 25 years from then — 25 years after the last baby has been born. In other words, itâ€™s all about a world where children have literally ceased to exist. 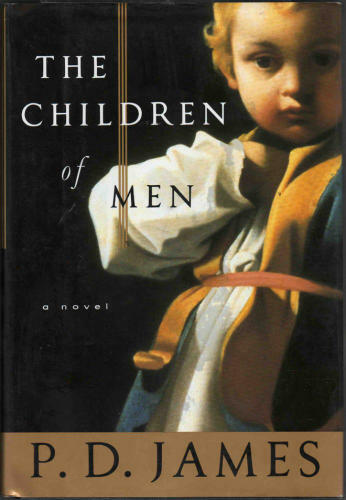 While the movie version is said to be mostly a shoot em up, non stop action film, the novel is more of a powerful meditation on how awful our world would be without any children in it. My brothers and sister in Christ, today Iâ€™d invite you to reflect on, not what our world would be like without children to brighten it, but on a much more disturbing thought: what our Church would be like if children disappeared from Her ranks. We observe this weekend throughout our country Catholic Schools Sunday. At the 10 a.m. Mass this weekend, the school children from Good Shepherd Catholic Regional School next door will do the readings and serve at the altar, and the student choir of 45 children will supply the music. But letâ€™s try to imagine what our parish would be like without Good Shepherd School being a part of it. Letâ€™s imagine what our city of Woonsocket would be like without Good Shepherd and the other schools that make up the Greater Woonsocket Catholic Regional System. What would our parish and city be like, without those 500 Kindergarten to 8th Graders offering up to God daily prayers for our community at the beginning and end of each school day, 180 days of the year? Or without Religion and Morality being taught to all those children, 5 days a week for an hour each day? What would our parish and city be like with no beautiful annual outdoor May Crowning led by the 8th graders, no annual outdoor Solemn Eucharistic procession, no Living Rosary every October, and no All Saints Day Mass with the 5th Graders all dressing up as their favorite Saints? What would our parish and city be like with no Catholic School Children in it raising $11,000 for Saint Judeâ€™s Childrenâ€™s Hospital over the past four years, or not raising over 4000 food items this past Advent for the needy who come to our parish food cupboard? What would our Church be like with no Catholic Schools? I for one donâ€™t ever want to find out. About 200 years ago, St. Elizabeth Ann Seton founded the first Catholic Schools in Maryland, amidst great spiritual and financial hardship. Since that time up to the present, the Catholic School System has survived only due to the great faith, the hard work and the sometimes tremendous sacrifices of Catholic parents, men and women religious, priests and lay people. Catholic education is truly a labor of supernatural love which the whole Body of Christ undertakes, a labor of love that as St. Paul says in the 2nd Reading bears all things, believes all things, hopes all things, endures all things. And to make Catholic education work requires great faith in the value of it. We see in the Gospel how the people of Jesus’ own home town of Nazareth, who grew up knowing and living with Jesus for years and years, failed to have faith in Him, and even tried to throw Our Lord off a cliff. May we not throw Catholic education off a cliff in our country today! For in doing so, we would truly be throwing off with itthe future health and well being of our Church in America. As we observe Catholic Schools Sunday this weekend, I beg all of you to be as generous as possible in supporting our Catholic Schools in whatever way you can. In doing so, youâ€™ll be seeing to it that 25 years from now, the blessed sound of playing children, who are learning each day to follow Christ the Good Shepherd, dressed in their school uniforms, will still be heard, coming from this parish during their recess, their voices blending in with the chiming of our Churchâ€™s Bells, and resonating throughout our city. Click here for a homily I preached on this issue a few years ago. Sorry, no homily this week, our parish had a guest preacher from Catholic Relief Services! You are currently browsing the fatherwoolley.com blog archives for January, 2007.